By the beginning of the Viking Age, the Scandinavian rune-masters had developed an alphabet, or “futhark” (from the value of the first six characters), of sixteen characters that was quite distinct from the rest of the Germanic peoples. This alphabet was known as the "younger futhark". However, even within Scandinavia, there was no standard form for the characters and there are variations from inscription to inscription, but basically there were two main forms of futhark: the Common or Danish futhark (although it occurs outside of Denmark), and the Swedo-Norwegian futhark (although this also occurs outside of Sweden and Norway. One can see that there are shortcomings with these alphabets. For example, there are characters for b, k and t, but there are none for p, g and d (this is because the futhark does not distinguish between these voiced and voiceless pairs. Therefore the rune-master had to use b for p, k for g and t for d.
There were other peculiarities: although there were two characters for the two different types of a, there were no symbols for e and o. This meant that the name “Svein” appears as in runes “suin” and the name “Gormr” appears as “kurmR”. It becomes even more complicated, as the spelling practice allowed n to be omitted when it occurred before a consonant. Therefore the name Thormundr appears as thurmutR. This of course means that many runic inscriptions can be very difficult to read and there can be a great deal of dispute about their true meaning. Despite the difficulties in reading runic inscriptions, they can provide a good deal of useful information. The time when the new futhark was being developed – c. 700 AD – was also a time of considerable change in the Scandinavian languages. These changes can be traced from the various objects bearing runic inscriptions. Moreover, these inscriptions can contribute to our knowledge of Norse history. 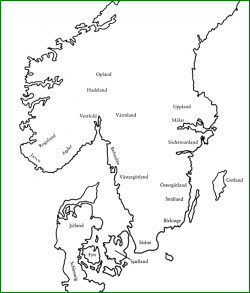 Most of our contemporary documentary sources were written by the enemies of the Vikings and naturally present a rather biased account. The runic inscriptions can tell us something about the Vikings’ side of things. A lot of the inscriptions come from the great rune-stones of the Viking period. These were often memorials, commemorating those who died far from their homelands. There are also some inscriptions that people put up in their own honour – “at sik kvikvan” (in his own lifetime) or “eftir sik siálfan” (in honour of the man himself) and often commemorate great deeds that the person had done. This inscription was found on a silver neck-ring which was part of a small Viking hoard found at Senja, Troms, Norway. The verse presumably explains where the silver came from. 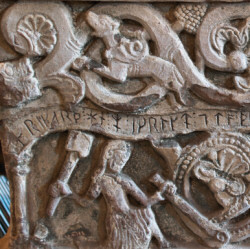 At Veda, Uppland a monument to Irenmundr tells how he “bought this estate and made his money in the east, in Garðar" (i.e. in the Russian trading towns). Other inscriptions tell of voyages over the Baltic: e.g. for Sveinn “who often sailed his fine freighter to Semigallen round Domesnas”, or for Björn who “fell in Viromaa”, or for Bergvið who drowned in Livonia. Thoraldr died “somewhere between Vitaholm and Garthar” and an unknown sailor (the name has been lost from the inscription) drowned near Novgorod when “his cargo-ship went down: only three escaped with their lives. Leader of the guard, the best of landsmen. Other inscriptions tell of voyages to Serkland (a land of dark-skinned people – the Arab caliphates). An expedition led by Ingvarr (later known as Ingvarr the Far-travelled) was particularly unsuccessful. Almost 30 monuments testify to those men who left with Ingvarr and did not come back. Died in the south, in Serkland. Other inscriptions from this ill-fated expedition include: “Thialfi and Holmlaug had all these stones set up in memory of Banki, their son. He was sole owner of a ship. He sailed it east with Ingvarr’s armada. May God help his soul”, or “Andvitr and Kiti and Kárr and Blesi and Diarfr put up this stone in memory of their farther Gunnleifr. He fell in the east with Ingvarr. May God help his soul”. 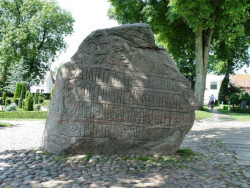 A stone at Högby, Östergotland, Sweden reminds us of how dangerous the life of a Viking could be. The inscription reads: “Gulli, a man of good family, fathered five sons. Ásmundr, a valiant fighting-man fell at Fyris; Ozurr died in the east, among the Greeks; Hálfdanr was killed in Bornholm; Kari (?died…); dead too is Búi”.